One of the greatest difficulties of winter dressing is the challenge of looking good without freezing your bum off. Especially in frigid cities like New York and Chicago, this can mean boring repeats of fleece lined leggings, office pants that can be tucked into winter boots, and a total forgoing of all the adorable dresses hanging in your closet. Luckily for you, this year designers seem to be embracing the idea of warmth and style by saying, "Why not throw those dresses on over your pants? It's a win-win, no?" But don't go running to your closet to grab that sheath dress and your favorite peg leg trousers just yet! The dresses over pants trend is a tricky one to master. In order to avoid looking like you're literally wearing two outfits at once, think about the proportions of your pieces. Shirt dresses work well over skinnier cut pants, while looser shift dresses give off a 70's vibe paired with wide leg trousers. Sweater dresses also work particularly well for this trend. 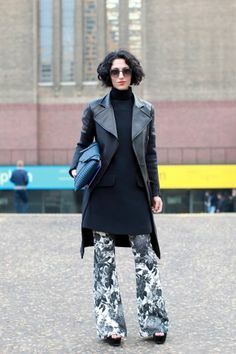 Runways have been showing off this trend for multiple seasons, and top fashion bloggers like the Man Repeller's Leandra Medine have adopted the look in their own ways. Medine's favorite version? Slip dresses with distressed jeans. While it may feel odd at first, you'll learn to love to ease and comfort of the dress-as-shirt trend, whether you're buying stamps for your brick-and-mortor emails or presenting at the office. To get more tips check out this video featuring Leandra Medine, made by Style.com.